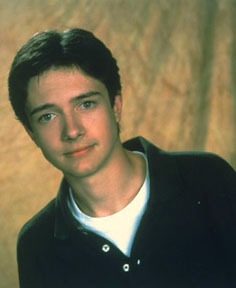 Topher Grace attended Brewster Academy, a boarding school in New Hampshire, where he was in a school production of A Funny Thing Happened on the Way to the Forum. A couple of Hollywood bigwigs were in the audience, because their daughter was also in the play. "As any parent knows, it takes a 5,000-ton magnet to pull your focus from your own child," says Bonnie Turner. "We hired the magnet." Turner and her husband Terry had written for Saturday Night Live, created Third Rock from the Sun, and they were putting together a sit-com for Fox called That '70s Show. A year passed and Grace was a freshman at the University of Southern California before the show was green-lighted, but he ended up with the lead. He had been in several school plays, but the pilot for That '70s Show in 1998 was his first professional role, and the first time he had acted on camera. When the show debuted, it was considered controversial, because the high school characters smoked marijuana, weren't punished for it or even caught, and didn't become drooling drug addicts. During the show's run, Grace launched his big screen career in Traffic, by scoring the dope that instantaneously changed the Drug Czar's daughter Erika Christensen from a straight-A high schooler into a sniveling addict. He was seduced by an older woman (Laura Linney) in PS, and he was the new boss who slept with an employee's daughter (Scarlett Johansson) in In Good Company.